Howard Walter Wright, left; Walter Savage Wright, his father, on the tiller. 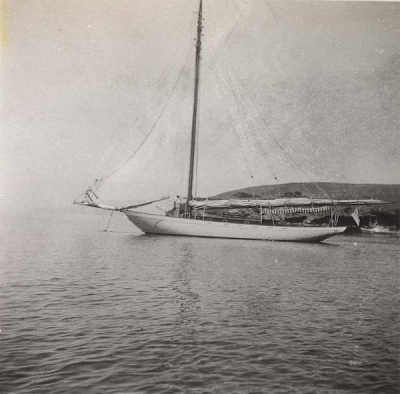 Siwash (#108355) (1913-current), sailboat given to Howard Walter Wright, Jr. by his father in 1911. “There’s no knowing what the builder, Charlie Fulton, intended to call the 47-footer he built in Wilmington, on the shores of Los Angeles Harbor. What’s certain is that this high school kid, Howard Walter Wright, hung around every day, lusting after the boat as it came together frame by frame. And come time to launch, some disgruntled yard worker chalked the world Siwash on the transom—it was a not quite gentle dig at Fulton, who had some Indian blood—and Fulton decided to paint the name on and let it stick." The boat, today over a century old, is owned by H. W. Wright's grandson. Present owner Bill wright allows, “I’m not really an avid wooden boat owner, but Siwash is a member of the family.” The boat is berthed in Alamitos Bay and sails under the colors of Los Angeles Yacht Club. And, Siwash continues to be a regular visitor to the favored coves of Catalina. WRIGHT, Howard Walter (1892-1977) [SS#550-28-4305], born September 6, 1892 in Pasadena, California, was the second of three children and only son born to Walter Savage and Bernice Wright. He lived in Pasadena his entire life, and attended Throop Polytechnic Institute and Stanford University. Between 1908 and 1913 Wright authored six articles in Condor. 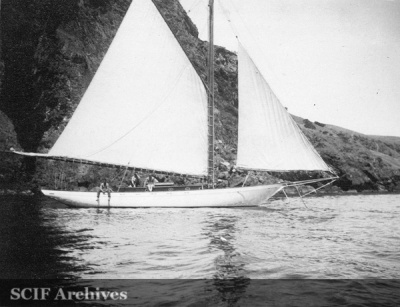 While in high school, Wright owned a 28-foot sailboat, Seabird. 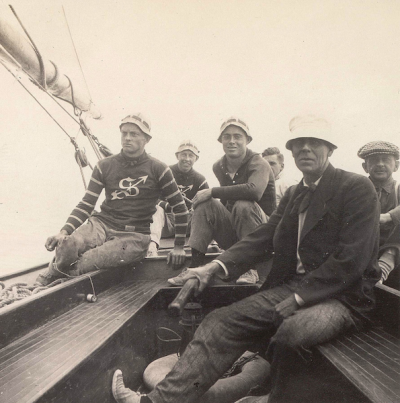 In 1911, his father gave him Siwash (#108355), a brand new 41-foot yacht, which Wright sailed for 45 years, after which he turned the boat over to his namesake son in 1956. A century later the boat is owned by H. W. Wright’s grandson, marine biologist, Dr. William G. Wright. Wright collected a set of Bald Eagle eggs on Santa Catalina Island on March 29, 1909 [WFVZ 3223]. 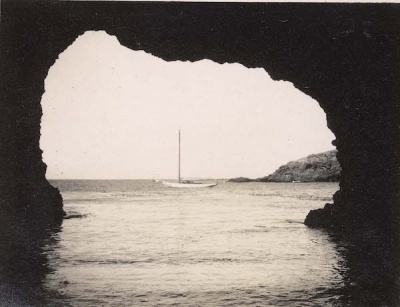 In July 1912, Wright, his Stanford friend, Gaylord K. Snyder, and others cruised around the California Channel Islands, visiting Santa Barbara, Anacapa, Santa Cruz and San Miguel islands, including Prince Island. Although they anchored at Santa Rosa Island they didn’t go ashore. The following year, in July 1913, he sailed Siwash to San Martin Island, Mexico on a birding expedition. Between 1908 and 1916, Wright collected birds on all but Santa Rosa Island, variously in company with ornithologists A. J. Van Rossem, P. I. Osburn and others. During World War I Wright served a lieutenant in the U.S. Navy. He gave up collecting birds to devote his time to his legal career. Wright was a Los Angeles attorney and member of both the California and American Bar associations. He served as commodore of the Los Angeles Yacht Club and the Trans-Pacific Yacht Club, and for 35 years held the sailing record around Santa Catalina Island. Wright died on September 11, 1977 in Pasadena, California at age 85, and his ashes were scattered at sea. He outlived his wife of over 50 years, Ruth Shelton (1893-1967), and was survived by his daughter, Elizabeth Merrell (1917-1994), and sons Howard Walter Wright, Jr. (1922-2007), Jefferson Chandler Wright (1927-2007), and Robert Shelton Wright (b. 1929). This page was last edited on 14 October 2016, at 20:33.